TNPSC குரூப் 2 தேர்விற்கான அறிவிப்பு இன்று வெளியாகும். TNPSC Group 2 Recruitment 2018: TamilNadu Public Service Commission Chennai has released the TNPSC Group II Interview Post Exam Notification 2018 on 10.08.2018. 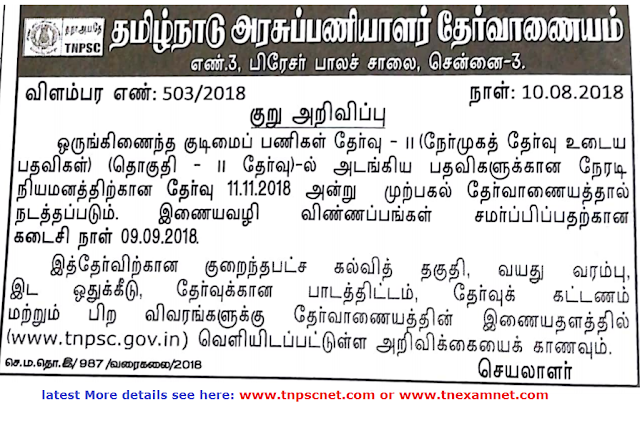 TNPSC Group 2 Interview posts Recruitment 2018: Tamilnadu PSC Recruitment cell has released the notification for Group 2 vacancies. From 10.08.2018 only the candidates can able to apply for the exam online. 2: Search for Group II Interview notification link in Advertisements page. 3: Download (or) view the official notification. 4: Check and verify your eligibility for TNPSC Group 2 Recruitment 2018. 6: Sign in to your account with your username and password. 9: Conform Ensure the given details are correct and accurate. 11: Make the payment if need. 12: Take print copy of application for future use.